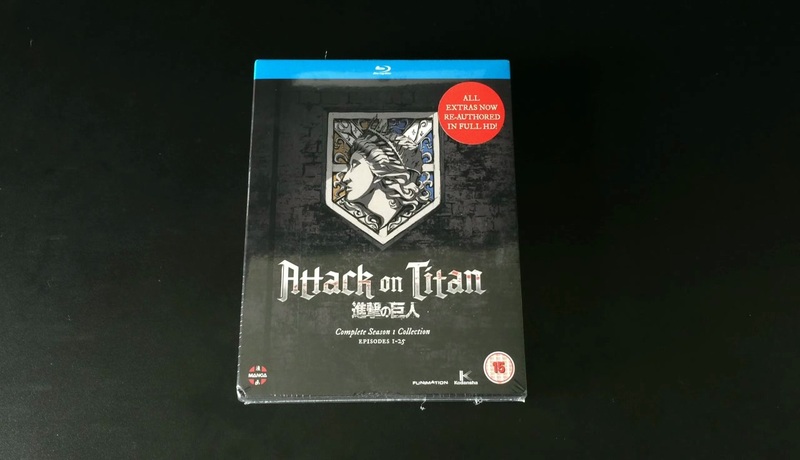 Earlier in the year Manga Entertainment UK re-released the first season of Attack on Titan as a complete season box set in an attempt to not only fix concerns over the first half of the series, which saw the bonus features stripped onto a DVD as part of the Deluxe Collector’s Edition (which we unboxed here); but to give potential newcomers to the franchise everything they would need within a single purchase. So is this Attack on Titan Blu-ray (which is also available on DVD) worth it? or is it just another missed oppurtunity by MangaUK? Well let’s take a closer look in our unboxing. 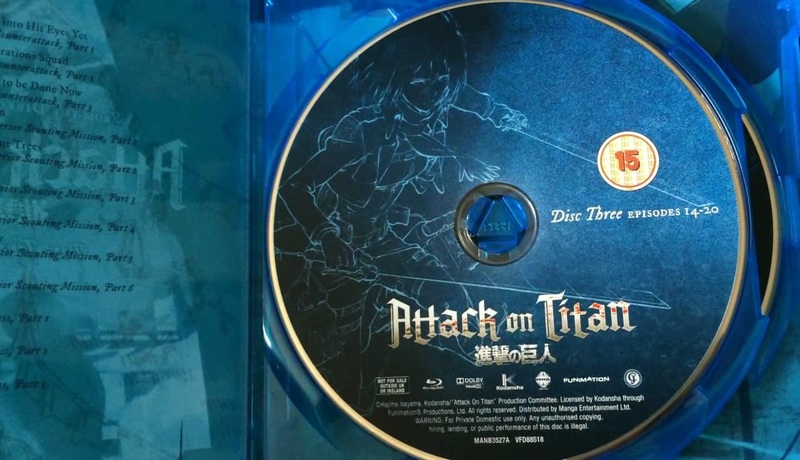 To start with this Attack on Titan – Season 1 release features two stand-a-lone amaray cases, entitled Part 1 and Part 2, bundled together in a thin carded sleeve and offers a similar experience to that of the previous release(s); of course this time the box that holds them actually says ‘Series 1’ and ‘Complete Series’ as opposed to the previous sleeve (which was bundled with the Deluxe Collector’s Edition of Part 1) that simply said Part 1 one of the front. While it’s nice that this ‘issue’ has been resolved it’s disappointing that a chipboard artbox – like those used with FUNimation releases – as it would have given this set a bit more value to it. Ironically enough that’s not the only disappointment as upon opening this set you will discover that Part 2 remains exactly the same as its previous stand-a-lone release and it’s only Part 1 that has undergone the re-authoring and manufacturing process. Is this a bad thing? Not entirely. Part 1, which featured episodes 1 – 13, was often critised for having the bonus features from the Blu-ray disc stripped onto a DVD and as such MangaUK have fixed this by releasing a modified version of Part 1 (with the bonus features in-tact on the Blu-ray) as part of this Complete Series set. This ‘fixed’ Part 1 release is never going to be released on it’s own as upon looking at the packaging you will notice that a barcode is not included; where as Part 2 does have a barcode. The bonus features on Part 2 were never stripped from the Blu-ray disc and as such in order to cut production costs (in half) MangaUK have simply bundled in the previously released Part 2 set with their newly authored Part 1 release to offer this complete series collection. Basically the Part 1 included in this set has been newly authored strictly for this Complete Series release; where as the Part 2 inside this release is the same one that MangaUK had previously released. Complicated back-story aside the disc contents and presentation remain exactly the same as their previous Part 1 and Part 2 counterparts; with Part 1 featuring red discs and Part 2 featuring blue discs – all of which feature the same selection of bonus materials and episode number. Part 1 features Episodes 1 to 13 where as Part 2 features episodes 14 to 26; all of which is presented in English and Japanese with English subtitles. Upon watching the discs you’ll soon realise that another problem presents itself; all of the errors discovered on the previous releases – such as incorrect subtitles, misplaced chapter markings and terrible subtitle placements – all remain on this complete series set. Initally it was expected that MangaUK would be using the disc masters created by Madman in Australia; but in actuality all MangaUK have done is added the bonus features back on to the second Blu-ray disc of Part 1 and left everything as it were; a simple fix for a not so simple problem. Truth to be told it is actually disappointing what MangaUK have done; many suspected to receive the ‘ultimate’ version of the series with issues from the previous release fixed for this complete series collection but in actuality all they have done is re-authored the second disc of part 1 so that it contains the bonus features and packeged it in a slightly different manner to its previous release. It’s a interesting attempt at fixing the problem; but the problems are still there. On a positive side not it does bring the entire Season 1 collection of Attack on Titan into a single set that would look great on anyones shelf and it is an improvement over the preivous release; but alas while one issue has been resolved (the lack of HD Bonus materials) another problem is created as the ‘Beyond the Wall’ notebooks are not included in this Complete Season release. Attack on Titan – Complete Series 1 Collection is now available on Blu-ray and DVD within the UK; alternatively if you wish to own the Notebooks as opposed to the bonus materials in High Deifnition then you could track down the individual releases of Attack on Titan – Part 1 (Deluxe Collectors Edition) and first-print-run editions of Attack on Titan – Part 2. Both of which are still readily available within the UK alongside this Season 1 collection. So basicly your saying: If you can import it from Madman Australia then do that and dont bother with this lackluster release? MangaUk has with a LOT of their titles lackluster releases. Missing signs and songs on Steins gate and guilty crown DVD releases for example. Its honestly pathetic. I try to avoid MangaUK releaes all together. For Attack on Titan the US (maybe even Australian) release would be be better than this UK release; in regards to Guilty Crown & Steins;Gate these are ‘modified’ versions of the US release so the content (other than trailers) would be the same as the US release. It’s been a long time since I watched the UK release of Guilty Crown & Steins;Gate but I don’t remember any major issues. The DVD releases dont have major errors however. Titles like Steins gate and quilty crown where they had to make the PAL format masters themselves. Titles that Madman ( or other Australian companies) provided the PAL masters has no problems. Ah right. My response was in reference to the Blu-ray releases of those series (which in turn were like-for-like except for the removable of FUNimation trailers). At that point in time PAL was the ‘universal standard’ for DVDs (especially anime titles) so that was unavoidable. Disc masters were also from Australia (which were also PAL encoded). It is only in the past year or so that DVD releases have become NTSC format but some DVD titles have been cancelled (or upgraded to Blu-ray) due to Japanese licensors wanting PAL format discs (this was to prevent reverse importation of titles from UK to Japan). In response to the anime with songs (especially on DVD) it might be worth checking to see if their are multiple subtitle tracks as most releases have two (full and signs / songs only) – if the subtitles are off then nothing will be displayed; but if the disc has a ‘signs/songs track’ it will display the subtitles during signs/songs – best to check this while the episode is playing rather than through the main menu.